TO most of his fans and followers on the Zimbabwean music scene, he is seen as the supremo at Military Touch, the music grouping that brought together some of Zimbabwe's finest musicians under one umbrella. When the label first announced itself to the public last year, it was assumed that the Jah, whose signature stage apparel has always been military gear, was the owner of the movement that he seemed to be the face of from day one. Since then, the success and failures of the venture have been pinned on him, as he at times has gotten plaudits for masterminding the birth of the star studded hit factory while in some instances accusatory fingers have been pointed at him for poor or selfish leadership. However, in a conversation on the Podcast, 2 broke Twimbos, the stable's producer, DJ Tamuka let the cat out of the bag, revealing that Jah is not the owner of the stable but rather acted as one of its directors. He said people sometimes confused JP Studios and Military Touch. "Let me say this once, JP Studios and Military Touch are two different entities. They're owned by different people. Jah Prayzah is a director in Military Touch but people portray him as the owner of Military Touch. No, there're different owners of Military Touch, some people that you don't even know, people that are not in music, some businesspeople," he said. Tamuka said confusion reigned because Military Touch was still resident at Jah Prayzah's studios. "It's unfortunate that Military Touch hasn't gotten its own space to say this is Military Touch Studios. So we're renting space from JP Studios. The setup is supposed to be like this: Military Touch is my space and then Jah has his own studio, X (XQ) has his own studio, Nutty (Nutty O) has his own studio but they come and record Military Touch business at MTM. If they need me at Jah's studio I will go, if they need me at X studio I will go so that ultimately what the set up is supposed to be," he said. The producer said this was something that they were in the middle of rectifying, as some artistes were reluctant to come and record with Military Touch because of its strong association with Jah Prayzah. "We're sort of fixing that because it affects the whole thing in different ways. People might feel like kuya kuya kuMilitary Touch kwana Jah hatiende kunorecorda ikoko, you know what I mean. But it's not Jah's Studio, he's a part of it. It's my studio," he said. Tamuka went on to explain how the label was branding some of the Uzumba musician's songs, with some getting the Military Touch Movement tags at the beginning while others did not. Over the last few years, Jah Prayzah has tried to find a balance between his traditional, mbira influenced sound and a more modern sound as he searches for more influence on the international music scene. "The songs that we put the Military Touch tag are the Afro Beat modern sounding ones. So we say this is Military Touch (on those songs), but you don't hear us putting Military Touch on his mbira songs," he said. Tamuka also touched on the departure of Andy Muridzo from the label, saying that the problems between Jah and his former protégé had been largely instigated by people on the sidelines. "I can't call it beef as such but it was a disagreement that was fuelled by spectators more than the actual people that were involved in it. You know like when you get people writing to say urikubatirwa, waita so, on social media (and) someone else will comment on that, even if you don't say anything as the artistes involved people will come up with their own conclusions and say there was beef," he said. 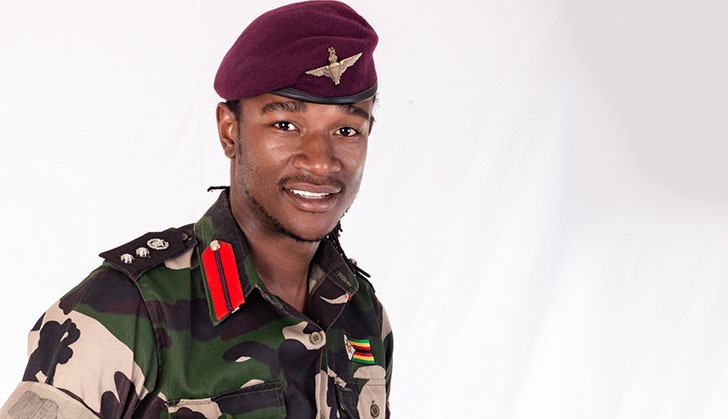 Tamuka said he did not see how Jah Prayzah could be blamed for any of Muridzo's problems while he was at Military Touch, as the lanky musician was taking money from his own pocket to support him. In fact, the Uzumba-born musician used his own resources to set the studio up, Tamuka said. "Honestly speaking when it comes to the infrastructure, in terms of the studio, we're using Jah Prayzah's studio. Basically he's the one that built everything. And most of the times, the guy is pulling money out of his own pocket. You know there are these beefs about Andy Muridzo left because Military Touch didn't do enough videos for him, they didn't do features for him, and you know it's only benefiting Jah Prayzah but Jah is the one that's pulling out money from his show. You both have shows, Andy has his show, Jah has his show, you come back and Jah gives Andy money for his video and then you go and say 'I didn't get two videos,'" he said. Tamuka said Jah Prayzah should be given credit for uplifting other artistes, something that a lot of other stars did not do. "Jah doesn't benefit a lot from this but when we do come together and do Chekeche, Jah is always there. People also see him as an icon, someone who brought people together and is not selfish because most of the times our superstars (don't do that). You'll not get someone that came out of Thomas Mapfumo. It's just him but he's a superstar. Sometimes you just need to share the power . . . to say he's making money from MTM benefiting a whole lot (is not true). Actually it's mostly negative," he said. Tamuka also said Military Touch had come together as a group after seeing the need to combine each other's strengths and fan bases. "The plan was to converge as different artistes to say lets meet up at a central place and let's help each other because if Jah has got two million followers on Instagram and I've got two, it doesn't make sense. So if he posts me, if we're affiliated I will get mileage from him. So it's sort of sharing power. It's like a power circle," he said.